Bitcoin’s average daily trading range so far in March is its lowest in nearly two years when, at the time, the world’s largest cryptocurrency was worth roughly a quarter of what it is now. At the time of writing, bitcoin’s average 24-hour trading range so far this month, defined as the average difference between the high and low price of each day in a given month, has been just $85, its lowest average range since the same metric recorded $32 in April of 2017, according to CoinDesk data. Notably, the average trading range (also known as the average daily volatility) segmented by month has fallen much faster than bitcoin’s market prices as can be seen below. 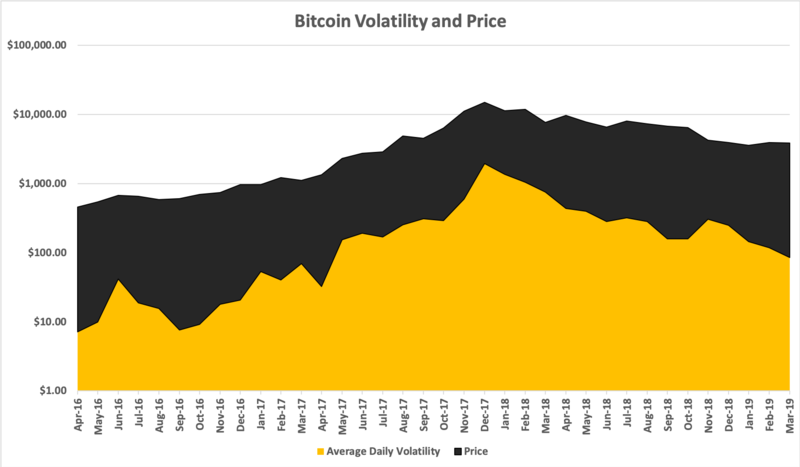 Indeed, bitcoin is currently trading across exchanges at an average price of $3,943, comparable to levels seen in September 2017, while volatility has returned to levels observed when bitcoin’s price was roughly $1,000. Yet, periods of low volatility tend to precede a big move in a market, as was the case in 2017. In fact, April of 2017 was the first month to close sufficiently above the top of its previous bull run in 2013 and was followed by a multi-year bear market. After April closed with an average daily trading range of $32, the price of bitcoin went on to surge 65 percent the following month with an average daily trading range of $153 – nearly four times higher than that seen the month prior. Just as bitcoin’s price was indecisive in April as it approached the key technical hurdle of a previous all-time high, bitcoin is now approaching another major technical hurdle in the form of long term downtrend resistance. 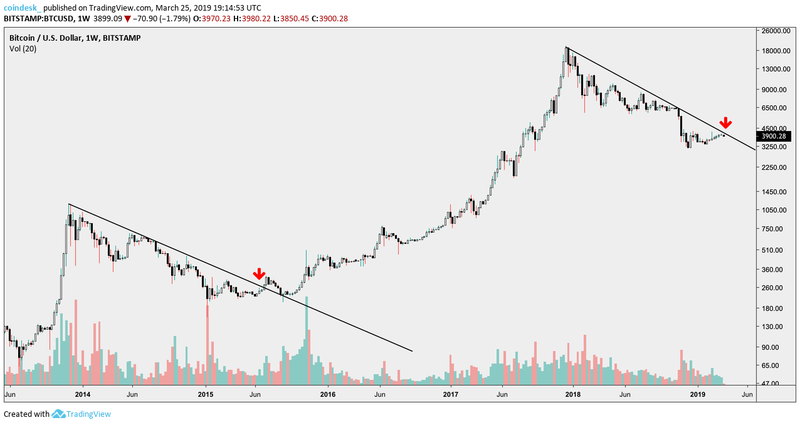 As shown above, bitcoin’s current price is just below a crucial downtrend line, which if broken could be a sign its market has shifted from bearish to bullish or at-least bearish to neutral, just as it did in 2015 when prices surpassed a near identical downtrend line.